Solution: A common form of elemental phosphorus is the tetrahedral P4 molecule, where all four phosphorus atoms are equivalent: . At room temperature phosphorus is a solid.Are there any lone pairs of electrons in the P4 molecule? 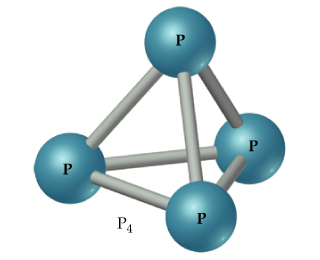 A common form of elemental phosphorus is the tetrahedral P4 molecule, where all four phosphorus atoms are equivalent: . At room temperature phosphorus is a solid. Are there any lone pairs of electrons in the P4 molecule?